Today’s recipe is ‘Aamras’. Aam ka ras is one of my favourite mango recipes. In north India, we enjoy Aamras with poori or chawal or plain. I personally like it having as a dessert without chawal or poori. It is basically a puree of mango which is sweet and tangy. You can adjust its consistency according to your preference. Use any variety of mango to prepare Aamras. fresh mango (any variety), milk, ice cubes, sugar, elaichi powder, water (if required) and dry fruits. You can also add saffron strands if available at home. You can use it immediately or refrigerate and serve later. Garnish aamras with dry fruits or tooti frooti. It is a very easy recipe which requires only smooth blending. 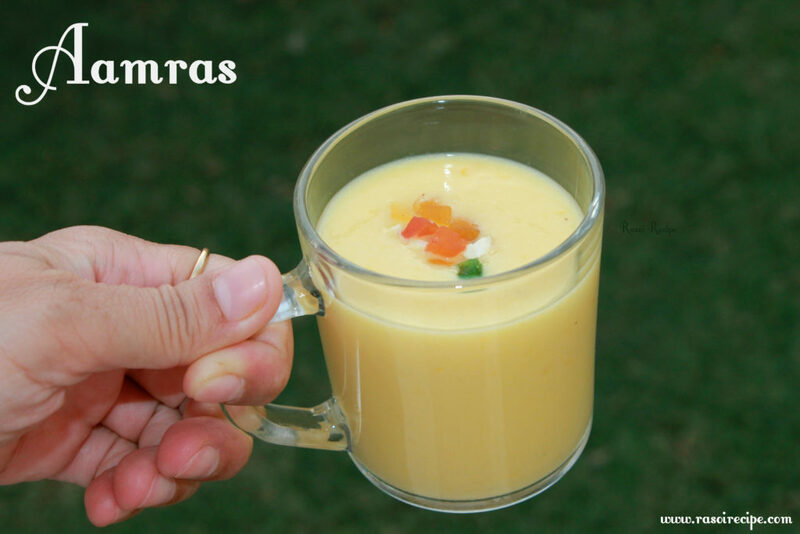 The best part of aamras is you can enjoy at the time of any meal from breakfast/lunch to dinner. Please note that quantity of sugar depends upon the sweetness of mango and your sweetness preference. Honey or cane sugar are two other alternatives to sugar. Peel and chop mango roughly in small pieces. In a blender pour milk and blend it smoothly with chopped mango pieces, elaichi/cardamom powder, dry fruits like(almonds, cashew nuts or pistachios) and sugar. Check the consistency, if it is how you want it to be. Then add ice cubes and blend it for one final time. 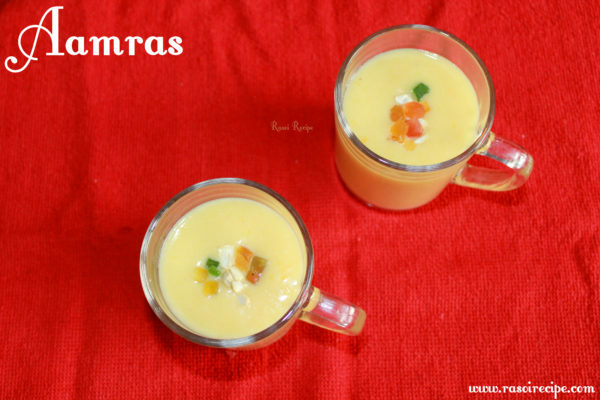 Pour the aamras in a bowl or glass. Garnish with dry fruits and tooti frooti or saffron.